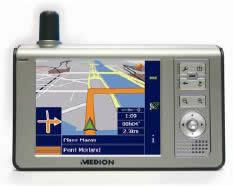 Medion released their 175 Gps in car Satellite Navigation system as their budget entry into the market. Boasting 3d maps, voice guidance, street level maps of the Uk, built-in Gps receiver, mp3 player & a bargain price. But is it any good? We've got to start off by saying that this is now a legacy device, obsolete, so its got old maps & an old operating system, so that has to be taken into consideration. Destinations are entered with a stylus on the touch sensitive screen, & the unit is a little clunky & slow. We can only enter addresses (town, road) or partial post-codes then road. Slow & cumbersome. Out on the road & the unit picked up a gps signal quickly, and navigated competently. I guess the system just feels old, not as quick & user-friendly as the newer Tomtoms & Navmans. If you don't mind spending a few days getting used to the awkwardness of using this Gps system, then it would be ok as a bargain or second-hand purchase, but I would still be inclined to put the cash towards a new Tomtom or Garmin i3.